Two posts in a week. This is a record for me at the moment. And in fact, two healthy food posts in a week. 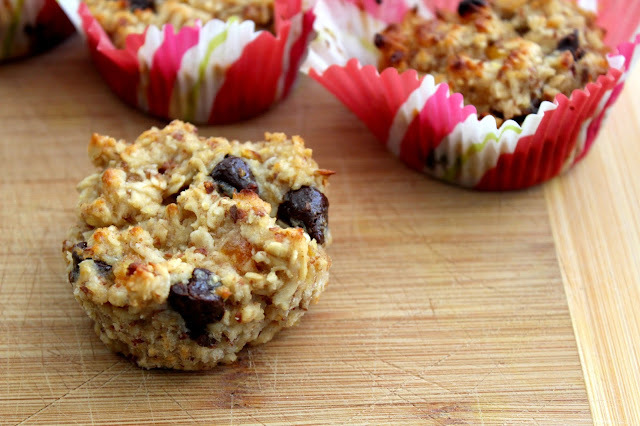 I know I say stuff like this regularly, but I cannot oversell these oat bar-muffins. I am only calling them 'bar-muffins' because I don't know what else to call them. They are soft, chewy and filled with all kinds of delicious things, like chocolate and apricot. 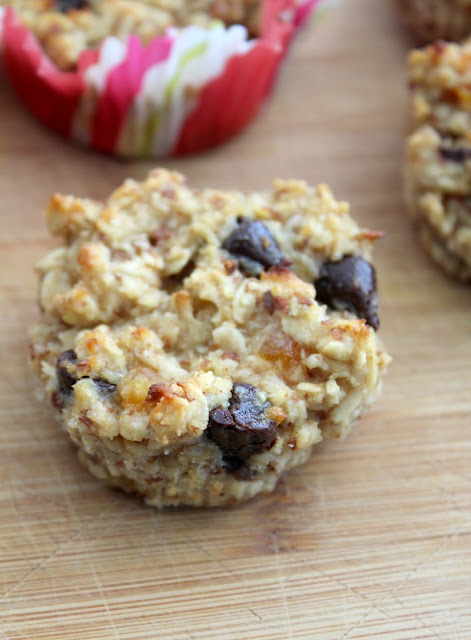 And they are rather healthy too - they're made with oats, almond meal, LSA, almond milk, and unsweetened applesauce. There is no sugar - only honey. There is also no butter, just a few tablespoons of oil. If you use natural dried apricots with no added sugar and dark (bittersweet) chocolate, you've got a phenomenal treat with little sugar. 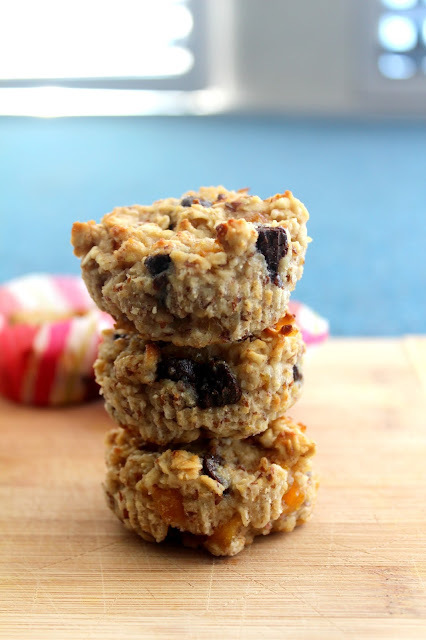 I love these as an afternoon pick-me-up, a morning snack or a quick treat after a workout. They have a decent amount of carbs, protein and fats. I actually should add peanut butter to the ingredient list because I absolutely love to top these with a large spoonful of crunchy peanut butter. 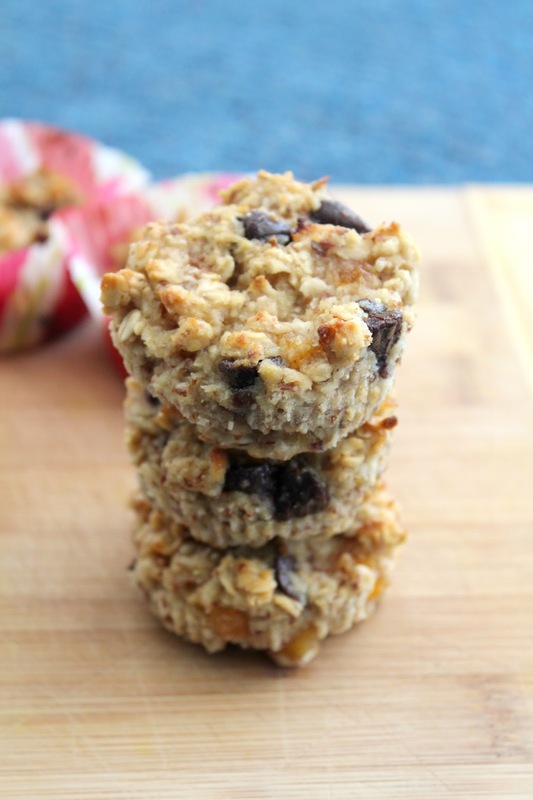 I love the crunch it adds to the soft oat bars, and peanut butter is a great addition to any chocolate treat. Recipe adapted from the ever amazing edible perspective. Makes 15 muffin sized treats. Spray and line 1-2 regular-muffin-sized tray with cupcake liners (you will need two muffin trays to make 15 treats, so you can either bake two trays at once, or if you’re like me and only have one tray, bake 12 treats and then 3). In a large bowl, combine the dry ingredients (first six). Stir well with a wooden spoon until combined. In a separate, medium sized bowl, whisk the egg. Add the milk, applesauce and honey. Whik together. Finally add the oil. Whisk into the mixture. Make sure there is no oil clinging to the top of the mixture and the honey is not clumped together. Pour the wet ingredients over the dry ingredients and stir with a wooden spoon until well combined. Stir in the apricots and chocolate until they are spread throughout the mixture. Place approximately 2 large tablespoons of mixture into each muffin liner, making sure the mixture fills approximately 2/3 of the liner. Bake for 20 minutes or until the tops are a dark brown and a skewer inserted into the centre comes out clean. To eat, top with a spoonful of peanut butter. 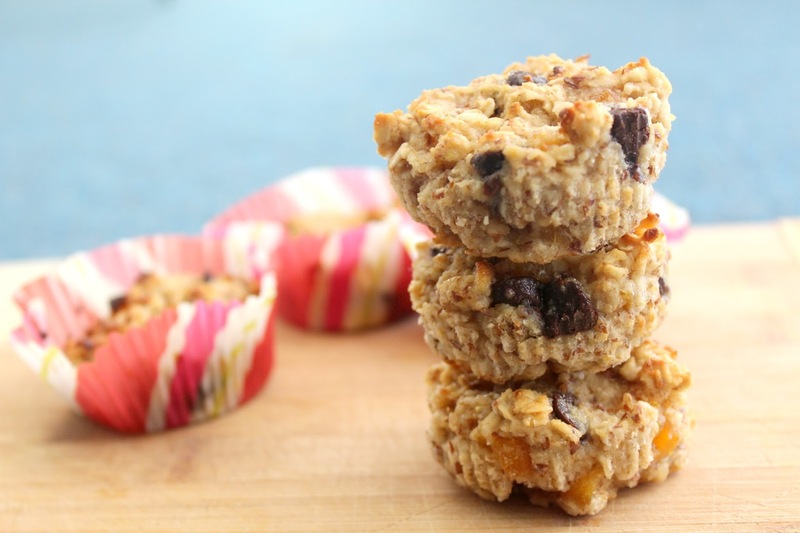 Apricots and chocolate sound like a fantastic combination!